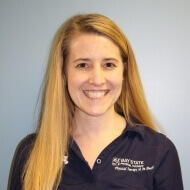 Megan graduated from the University of Maryland Baltimore with her Doctorate of Physical Therapy Degree in 2013. Her post-graduate training includes completion of a one-year residency program in advanced manual therapy techniques at the Institute of Orthopedic Manual Therapy which she has brought to her treatment of neck, back, shoulder, elbow, hip, knee and ankle injuries. Megan has extensive experience treating a variety of orthopedic, post-surgical, overuse, traumatic and athletic injuries. Megan also has experience treating MVA and work-related injuries. Her treatments combine manual techniques, therapeutic exercises and functional/sport training, injury prevention and patient education. Megan enjoys working with recreational and competitive athletes and runners of all ages. Megan has also completed training in pelvic health PT which carries over into additional clinical interests of treating hip/back injuries with special interest in labral tears, hip/pelvic surgeries, piriformis syndrome, SI joint pain, and pre & postnatal care.